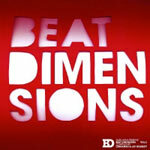 Rush Hour Records presents Beat Dimensions Volume Two! Compiled by Cinnaman and Jay Scarlett and featuring soon to be known in a much better light names including Danny Breaks, DJ Adlib, Mono/Poly, Dizz1, Dimlite and more! Featuring a lot of Flying Lotus style beats for comparison, with a little dubstep, but just think of a harder version of both, raw and dirty but not alienating to the listener. Basically, the headnod factor is through the roof! Broken up into two EP's with a third on the way...HEAT!